It's bright isn't it? Scareee! But brightness aside, this is actually a little gem of a top. Remember Whistles were doing their expensive sculptured tops last season? Well this one is a lovely take on them and it only costs £12. There are a lot of similar tops on the high street currently and some are done better than others and this one in my humble opinion is a goody and looks more expensive than it actually is. It even manages to look more expensive than some of the more expensive ones out there too! It's a nice crepey polyester fabric (the Whistles one is too!) which means minimal creasing so you can shove this in your workbag for going out and then pull on a statement necklace if you're into that kind of thing or you can wear it all day casually like a tee and be safe in the fact that your top doesn't look like a Sharpei's face by the end of it. 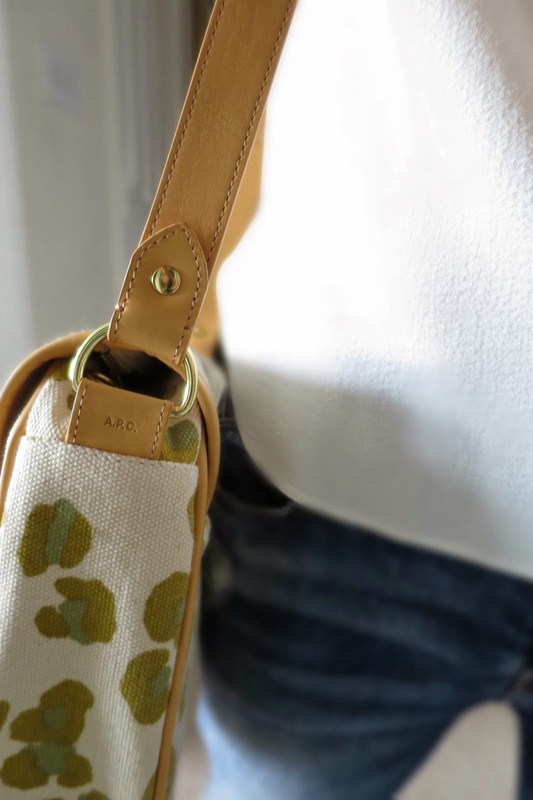 It's also a little lighter in weight than the Whistles top but that's not a bad thing because eventually the weather will turn a little warmer and what you have here is a a great little throw it on top which you shouldn't overheat in. It even has a little stepped hem - just like the Whistles version which I happen to have in ivory/white. 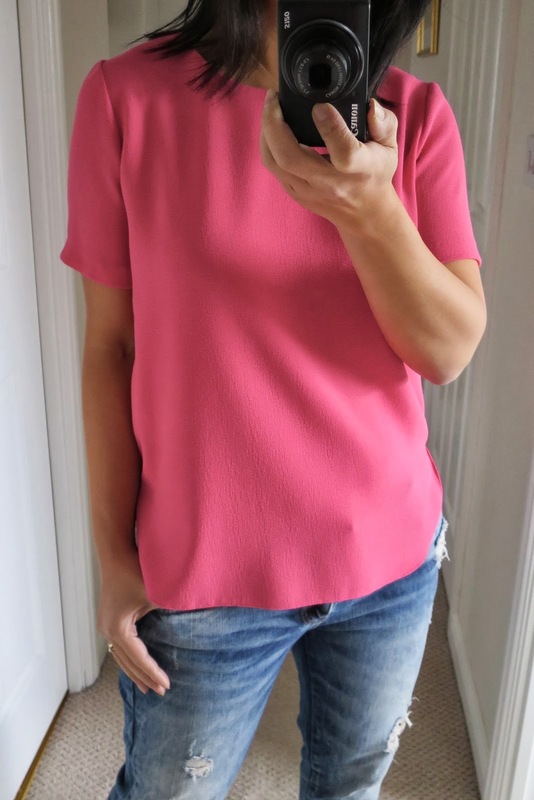 When I got bored of the ironing the other day, I thought I'd have a little play with this top to see how I if I could work the pink or if I'd had a moment of madness. I have to say that this pink is very much a summer colour for me and though it looks a little wrong in the cold February light, it will look very right come June/July when the light denim comes out, the toes are aired and we are all looking a little more tanned and healthy. If I had a lovely white skirt to wear with the top like this one - and long long legs, that is what I would want to wear but I haven't so you will have to make do with me in blue jeans instead. ... and it looks okay pared with black too. .... and I kind of like it ... but if I'm being honest here - I'm terrified of the colour! I love it! But I'm terrified! I love it! But I'm terrified! Can you see the turmoil? I'm also trying to work out if this is the right shade of pink for me. I might sit on it for a few more days before I make my mind up. Anyway, what do you think? Am I a pink girl? Can I do this? Or should I stick with the ivory white version instead? In all honesty - these are lovely tops and well worth the money. If you can't do pink, get the white. If you can do pink, get the white as well! Size up. Well I had to - doesn't mean you have to but I had to. For all those people who struggle with wearing a casual white tee - this is a good alternative! 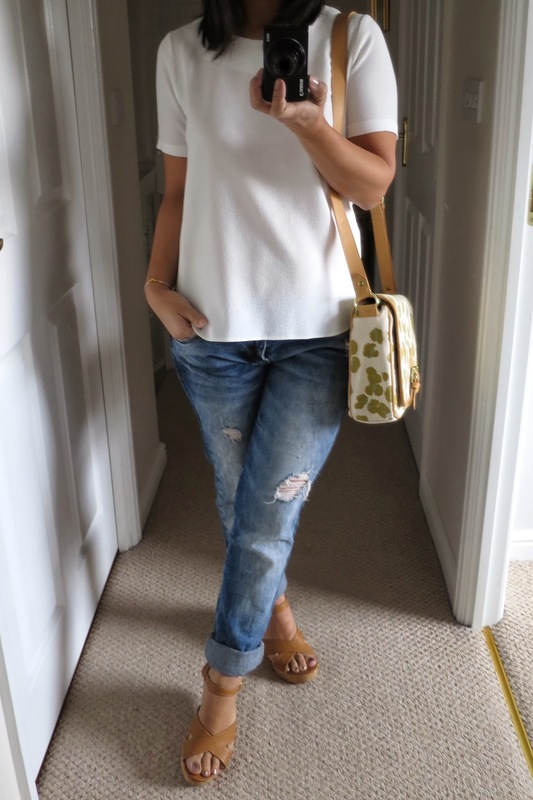 Take a look at Trea's post on shell tops where she has done a great roundup of the ones out there currently and look at how she's wearing hers for more inspiration. Update : 08/02/14 - the link to the top keeps moving so for reference - the product code for the top is bb411193. It is the brighter pink of the two pink shell tops which they currently have on the website. Well I did try my usual size on but they were just a little big snug on the shoulder so I went with the size up and it worked out okay. Quite surprised actually as I find that supermarket items tend to be cut a little more generously ... but in this case, not this one. It's a brilliant little top for wearing under a blazer for a smarter look if you can work that kind of look or for the office even. But it's so scareeee Donna! I put on the white version and all order was restored! I used to do a lot more colour but I seem to have stopped wearing it and now anything like this makes me take a step back. Is this pink classified as a deep colour? 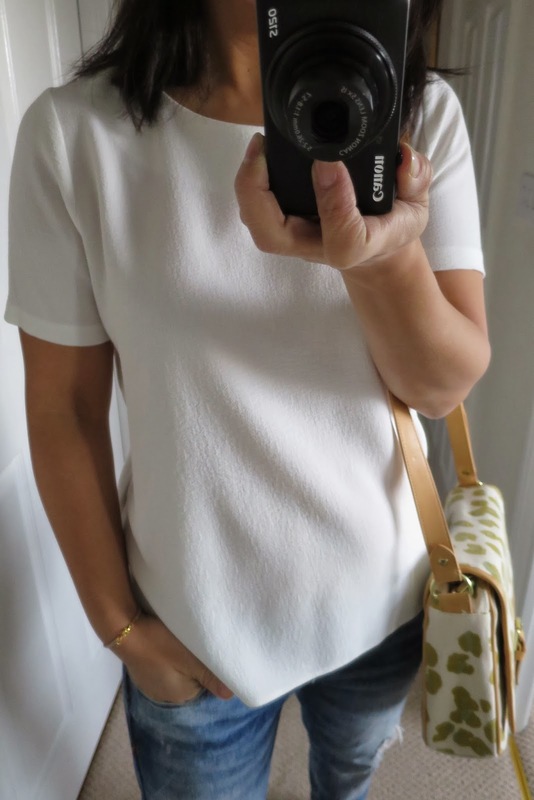 Jane, it's not the most exciting thing you can get but it could be one of the most useful and versatile tops to have for doing that elegant casual look that you do so well. And I don't have many necklaces so I guess the only statement one I have has got to count. Well look at you! Looking all fab in pink! And yes, you know I've bought them both as well and completely agree with your assessment (and have to confess I'm a bit terrified of the pinkness as well) But they look great on you ... and you've inspired me to stick to my diet so that I can look just as svelte by the time the sun comes out!! I actually think you will really suit this pink actually. DId you find it surprising to find yourself gravitating towards this colour? And yeah - I'm pretty scared. But we can be scared together. Thank you! A little treasure in between the shopping aisles! Who would have thought! Well I'll keep my fingers crossed for you that they still have some stock in for you in March. Thank goodness, February is a short month! My finger is hovering over the checkout tab for the Tesco cami in charcoal which I have heard on good authority is on par with the Topshop ones last year!! Of course I shall now have to add the pink and cream shell top as well as they both look so good on you!! The grey cami is quite true to size (yes - I went and tried it on) but I found it a little sheer and you definitely need either (1) fabulous underwear that you want to show off underneath it or (2) another layer. The Topshop ones win on the fabric this time but they were double the price. I ummed and ahhed over it as I have the perfect little Kimono jacket that it would have gone under. And have you seen this black one? http://www.clothingattesco.com/tops+t-shirts/f+f-organza-stripe-shell-top/invt/bb411204&bklist=icat,4,shop,catgwomens,womens-tops-and-t-shirts Would be fab with a pair of leopard courts in the evening and some jeans? I think this one is TTS. Oh yes - the bracelet. On my list of to do's to list on the shop tomorrow. It's one of those that I made for fun. I need to put some new designs on - I have been very neglectful of the shop. The white just feels much calmer doesn't it and more me? I like it more because it's such a classic combo and is much easier on the/my eyes. I think you like similar more muted tones like me. Funny that - I found it a little snug on the shoulders so sized up for that reason but luckily it doesn't seem to look too big or swingy. But gosh - I bet that's frustrating about the old bust because it is a bargain .. if it fits. And I've tried lots of them on and the fit can be a little looser or tighter despite all saying the same size. So guess who had an armful of them in the changing rooms? I like to make really sure I got the best and the right one. I have to say, it's a lovely crepe. Just done incredibly well. I wonder if someone made a mistake somewhere ;o) They have other shell tops which are in a similar price bracket but just not on a par. The pink is the one I'm dithering over - I'm sure when the sun is shining, it's a no brainer but right now, I just can't tell. And you for one would look fantastic with the pink top set off with one of your lovely skirts. 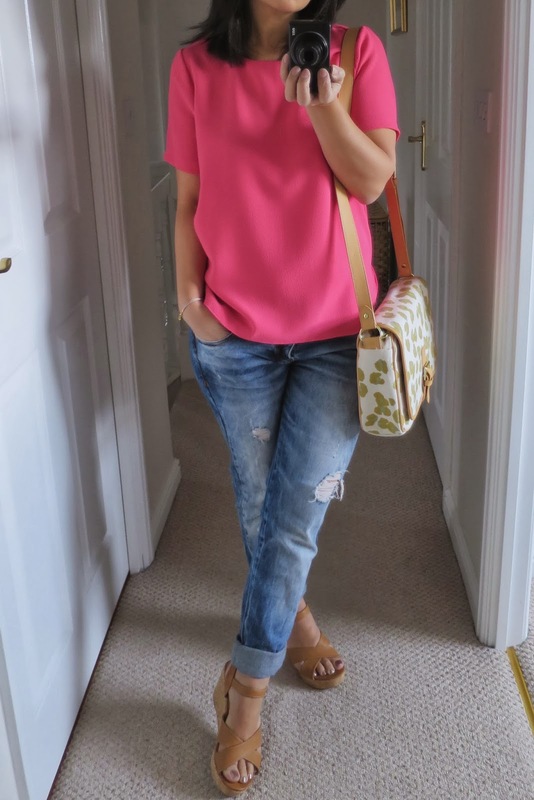 Top looks fab in both colours a great alternative to a tee. I love the bracelet and would love one when they're listed. My moonstone necklace always gets compliments. BUYING IT NOW! Wow it's ace! I bought an amazing yellow top from there last summer - it really should have been £30 instead of the £10 I paid - I LOVE TESCO! The pink or the white? Or both? I take it you're not doing frugal February then? You're a colour monster then are you? I'm trying to introduce a bit more colour in to the wardrobe but there's nothing like throwing yourself in to the fuschia pink end is there? Ah my beloved shell top, cannot believe I didn't see these before I don't my shell top post. I've just ordered the pink, cream and of course the yellow, and the yellow dress too. Probably wouldn't have gone for the pink until I seen it on you, its stunning and you've styled it to perfection! Whistles who??!!! Wow - you do like your yellow don't you? And I don't think I've seen you in pink before ... but I bet you'll love it. You're brilliant with strong colours like that. Definitely get another ivory/white one - it will see you through the summer during the day and save the Whistles one for the evenings. That's one of the reasons why I got the white. I'm sure you could find some use for the pink one too? You can definitely wear all sorts of bright and beautiful colours but it's a question of would you really do it? I want to love the pink and it looks gorgeous on you but prefer the white plus if you're going to wear it more, it's a no brainer for me. I would find it easier to add coloured accessories to the white. To me it's less the cost but the frequency of use that matters more and I'm trying to stop the multiple colourway buys habit. You have such a valid point SPD. I know the white one is a definite but the pink is a bit borderline for me. When I put it on, it feels lovely and is such a surprise and then I have that moment of doubt which says is it really me? Thank goodness for return policies should I decide it's a no go! And if it goes back, you can give yourself a pat on the back and say "I told you so!" I cannot even believe you got this top from TESCO?! What is going on. Why is there no Tesco in Zurich? You can totally pull off the pink one although, I have to admit, in my books the white is very chic. I agree that the pink might be a bit easier to swallow when the weather is a bit warmer and bright colors feel more appropriate. Totally love them both though. You should definitely keep them. Also, totally agree that they are such a great alternative to a T-shirt. Way more grown up and put together. Definitely very comfortable with the white and definitely keeping this one. The pink I'm still making my mind up on as it's a little out of my comfort zone. I wish they'd done it some other colours as well but knowing my luck, it would be orange or purple or something - something just as challenging. But yeah - Tesco did good!! Electric pink looks great on you! And you're right the shirt looks a lot more expensive than it actually is, so great find on your part :) I also quite like bright colors in winter - they help pick you up when everything else is dreary! Also, I'm in love with that bag. Also...those leopard shoes from M&S...who would have thought they're from there. They look so...well...expensive. SCORE! They both look amazing on you, I do hope you're keeping the pink despite your initial hesitations. So pretty, so effortless without looking sloppy at all. Perfect! Who woulda guessed...? Really?? You like it? I would never have thought you would go for a pink (even if it's on me). You're right, I would never have guessed! Okay - you're swaying me! Just keeping you on your toes Sue! Maybe that's exactly why I love the pink, it feels unexpected and unpredictable. 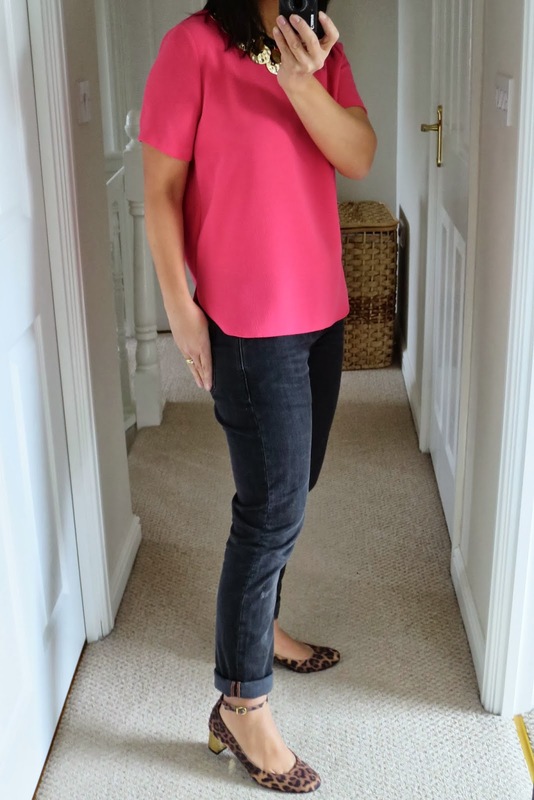 Hi, have just found your blog through I don't wear sludge brown, love the pink top - so much so have ordered one, also love the bracelet, how could I get one please ? Hi Sue, thanks for popping over from Donna's blog! 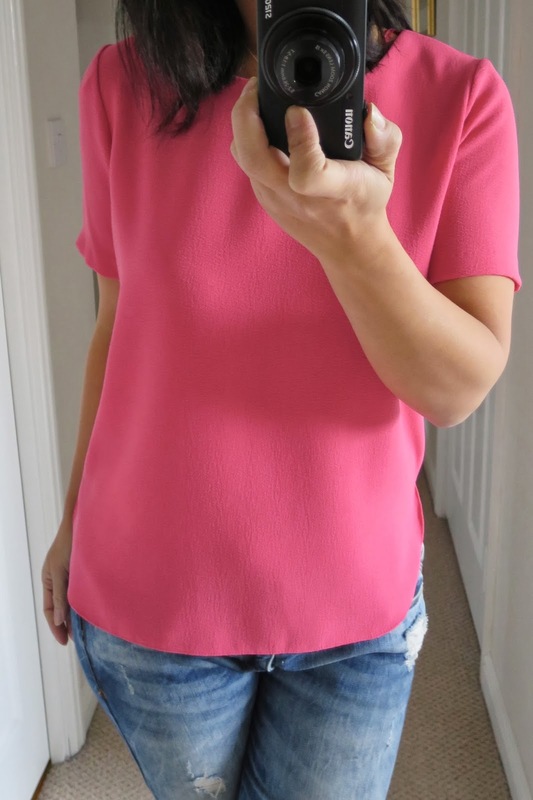 Glad you like the pink top - honestly, this is a rare thing - you don't often see me in eye popping pink tops - I'm a bit of a monochrome girl myself but I am trying to introduce a little more colour in to the wardrobe. And the bracelet, I will pop up a little post later in the week when I have got them ready in the shop! I'm on the edge with the pink but the white is a no brainer. And I actually live between Leeds and York - I have my shopping pick of the two though I favour Leeds. Steph - you know what Tescos is? But yes, it is from Tesco and it's a goody. The white one is very you and would be the perfect accompaniment to all the dark pieces in your wardrobe. The pink one ... I'm not so sure about. haha yeah we have tesco in malaysia and it's really popular, next to carrefour.. i'm strangely familiar with brit stores, mostly from reading brit mags as a teen! none of these stores are down under however..
Hi, I'm Sue. Mum to Ben & George, married to the Grumps, living in suburbia, somewhere in the north of England. Please note - I do use Skimlinks on this Blog.